A native of Raleigh, NC, Joy Parks, began her art “career” as a small child when, as a fourth grader, she won her first blue ribbon in a county-wide art exhibition. Later, her high school art teacher encouraged her to become an art major in college. Joy took her teacher’s advice and attended East Carolina University School of Art in Greenville, NC. In 2013 Joy married James Coats and moved to Carolina Beach. Even while she lived in Raleigh and Greenville, Joy loved painting art with a nautical theme. Moving to the coast has given her even more inspiration to paint “nautical” art. She also loves to travel, especially to places in the Caribbean where palm trees, sail boats, and other nautical themes abound. Joy loves palm trees swaying in the tropical breezes, sunrises and sunsets over the salt marshes, waves crashing on the shore…. It is her hope that her paintings evoke a pleasant memory or give a feeling of peaceful and calm tranquility to the viewer. Joy Parks Coats is an award-winning artist who has made quite a name for herself in the art community where she currently resides. 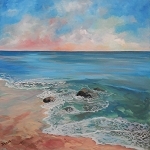 She is a current member of Acrylic Painters USA, Oak Island Art Guild, and Associated Artists of Southport, and is a former member of the Visual Art Exchange and the Plein Air Painters Group in Raleigh, NC. Her art is in various collections in the United States and in France.